Marshall Jefferson had this song in his head whilst working at the post office. He figured out all the parts, then got fellow PO workers and friends Curtis MCClain, Thomas Carr & Rudy Forbes to join him at Lito Manlucu's studio. They recorded a version, but his 3 friends thought that it sucked. That night he took the tune to the Sheba Baby club and played it to the DJs Mike Dunn, Tyree Cooper and Hugo Hutchinson. They loved it, but wouldn't play because of the piano, which they thought wasn't "House music". He then drove to the Music Box to play it to Ron Hardy. In his car he played it to K.Alexi Shelby who was also not impressed, also thinking that it wasn't House music. In the club he gave it to Hardy, who played it straight away, then played it back-to-back 5 times. 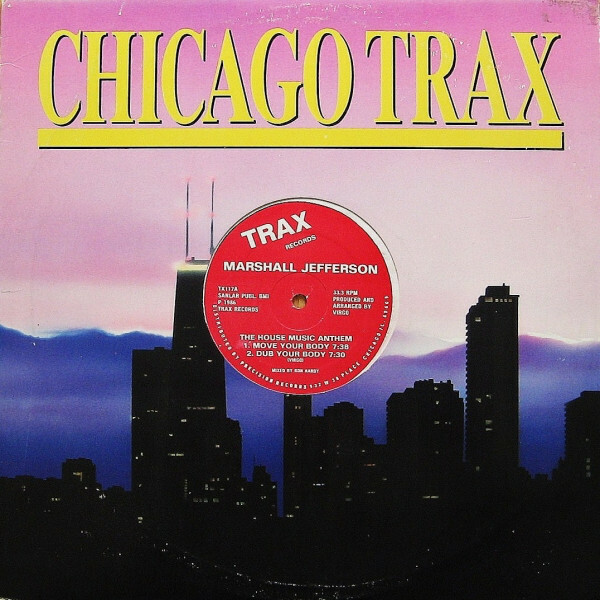 It became the biggest tune in Chicago and Hardy asked him not to give it to other DJs. Eventually Marshall Jefferson couldn't stifle demand from other DJs anymore and he gave it to Frankie Knuckles to play. He also took it to Larry Sherman at Trax. He also hated it and said it wasn't House because of the piano. Marshall didn't care and paid Larry to press it up.... which finally happened 13 months later. The version on DJ International came about because Marshall thought he could record a superior version in a bigger studio. He went to Paragon studios to record it. This was meant to have been released on Marshall's own "Other Side" label, but at the last minute Larry Sherman scratched out the "Other Side" label number on the mothers and replaced it with a Trax number. If you own a release with a scratched out "Other Side" number you know it's an original release. Larry Sherman also didn't bother too re-master or re-cut it. Also the release was meant to be credited as On The House, as Curtis McClain, Thomas Carr & Rudy Forbes had helped write the tune. Larry just credited it to Marshall Jefferson, which caused a lot of friction between Marshall and the other people involved. They came around his house to confront him, Marshall telling them it was Larry's fault, which they didn't believe. They only believed him when they confronted Sherman, who told them to piss off. A friend of Curtis McClain called Norman David got Marshall to sign an affadavit stating that they had sang the vocals on the record. They took this to Larry who claimed that he had given Marshall $150,000 and that he had put Marshall's name on the song as that was required in the contract. They went back to Marshall demanding their cut only for Marshall Jefferson to tell them that he ad not received a penny from Larry Sherman and had, in fact, paid HIM $1,500 to press up the release, which they didn't believe, even after he had showed them the receipt. They then said that Sherman had offered them a contract, which they were going to sign and get rich, a course of action which Jefferson tried to stop. They later had 2 releases, but got paid nothing from Sherman.